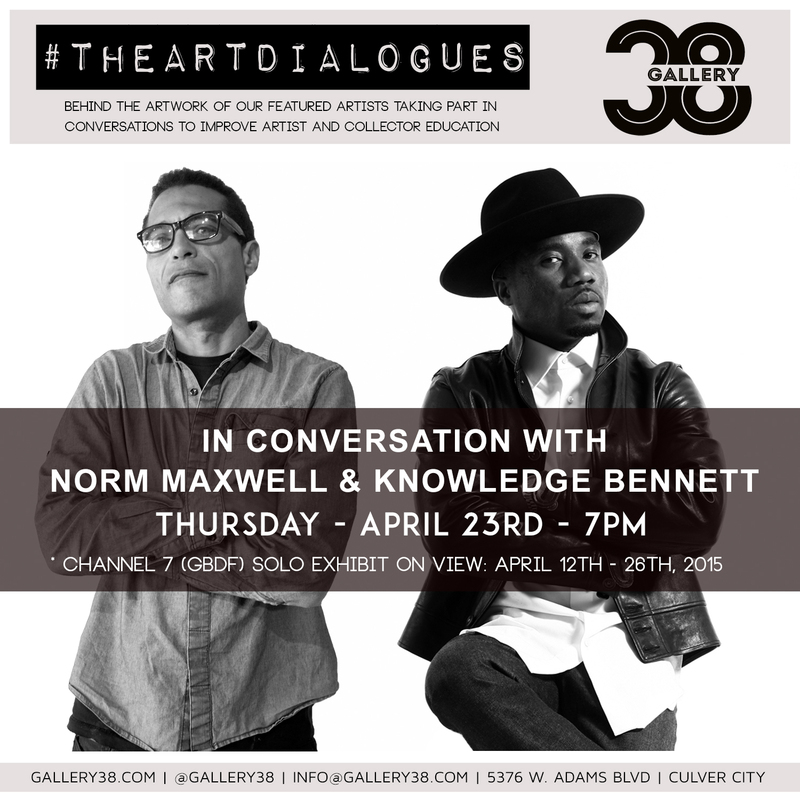 Gallery 38 launches it’s newest series, #THEARTDIALOGUES with Norm Maxwell and Knowledge Bennett. This series offers a glimpse into the featured artists and their work through intimate artist conversation with a goal to improve artist and collector education. The event will take place on Thursday April 23rd and include an exclusive signing of limited prints by both Norm Maxwell and Knowledge Bennett. #THEARTDIALOGUES series debuts alongside Norm ‘Nomzee’ Maxwell’s “Channel 7 (GBDF): A Composition in G Major” solo exhibit and in the midst of Knowledge Bennett’s ‘COJONES’ series featured at Guerilla Atelier and Canvas Malibu. Be sure to save the date and #RSVP (rsvp@gallery38.com). Exclusive signed prints from the artists will be available. FURTHER INFO: Norman Maxwell is an American Contemporary Artist living and working in Los Angeles. His work is a commentary on social issues concerning Politics, Religion, Mythology, Popular and Urban Culture. Maxwell’s signature style references a broad range of genres, merging traditional techniques with his graffiti-esque aesthetic to create a rich and diverse visual language that is uniquely his own. The exhibition entitled “Channel 7 (GBDF)” is a series of visual musical compositions where the 7th Channel denotes the G chord in the musical scale. The number seven is a mystic and spiritual number that is synonymous with creation. In this series Maxwell ponders the subject of creation, involution and evolution. Knowledge Bennett is a self-taught visual artist with roots in Harlem N.Y. as well as Asbury Park, N.J. With an audacious approach, his character reimagined silk-screened paintings have taking the art world by storm and have single handedly awaken the art enthusiast in many far and near. His latest series titled “Cojones” has art aficionados and novice appreciators alike foaming at the mouth. “Cojones” is a series where Mr. Bennett has taking a 1989 publicity still of Hip Hop artist Slick Rick, captured by music industry photographer Janette Beckman and transformed it into various popular culture influencers of old and new. From one character to another each finished painting takes on a meaning of it’s own. Yet collectively the series has come to represent the ultimate statement in defiance, courage and independence. Gallery 38 is an ongoing project and creative art space brought together by ArtAboveReality and Bancs Media that brings together established, as well as up and coming talent, (some of which are represented by the gallery) and pairs them in visually thematic exhibitions. These unique artist light up the gallery daily, and differ in medium and composition, but are brought together by their unifying element of mixing mediums, art aesthetics and thought provoking content and imagery.